E-Z FINANCE, LOW LOW MILES UNDER FULL FACTORY WARRANTY REMININING CLEAN AUTO CHECK / ACCIDENT FREE ONE OWNER,NAVIGATION, LANE DEPARTURE WARNINING, Back-Up Camera Bluetooth Connection Climate Control Integrated Turn Signal Mirrors Keyless Start Multi-Zone A/C Navigation Power Driver Seat Power Passenger Seat Premium Sound System Rear Parking Aid Satellite Radio Seat Memory Smart Device Integration Tire Pressure Monitor WiFi Hotspot, NAVIGATION, Lamp, LED center high-mounted stop/brake (CHMSL), KEYLESS START, Headlamps, projector type halogen, includes flash-to-pass and Twilight Sentinel, Blue Tooth, BACK-UP CAMERA, 7 Touch Screen CUE SYSTEM. This Cadillac ATS Sedan has a powerful Turbocharged Gas I4 engine powering this Automatic transmission. *Experience a Fully-Loaded Cadillac ATS Sedan Luxury Collection RWD *SAFETY AND SECURITY PACKAGE includes Safety Alert Seat, (UEU) Forward Collision Alert, (UHX) Lane Keep Assist, Lane Departure Warning, (UKC) Side Blind Zone Alert, Lane Change Alert, (UFG) Rear Cross-Traffic Alert, (CE1) Rainsense wipers, (N08) locking fuel door, (TQ5) IntelliBeam headlamps, (AYF) rear thorax air bags, (UTR) additional shielded theft-deterrent alarm system, (UTU) tilt sensor, (ULS) steering column lock and (PB4) locking wheel lugs, DRIVER AWARENESS PACKAGE includes Safety Alert Seat, (UEU) Forward Collision Alert, (UHX) Lane Keep Assist, Lane Departure Warning, (UKC) Side Blind Zone Alert, Lane Change Alert, (UFG) Rear Cross-Traffic Alert, (CE1) Rainsense wipers, (TQ5) IntelliBeam headlamps and (AYF) rear thorax air bags, ADVANCED SECURITY PACKAGE includes (UTR) additional shielded theft-deterrent alarm system, (UTU) vehicle inclination tilt sensor, (N08) locking fuel door, (ULS) steering column lock and (PB4) locking wheel lugs , WIPERS, RAINSENSE, WHEELS, 17 X 8 (43.2 CM X 20.3 CM) POLISHED ALLOY (STD), WHEEL LUGS, LOCKING, TRANSMISSION, 8-SPEED AUTOMATIC (STD), TIRES, P225/45R17 ALL-SEASON, RUN-FLAT (STD), THEFT-DETERRENT ALARM SYSTEM, SELF-POWERED, SHIELDED, STEERING COLUMN, LOCK CONTROL, SIDE BLIND ZONE ALERT alerts driver when a sensed vehicle is in blind spot, SENSOR, TILT, SEATS, FRONT BUCKET (STD), RECEPTACLE, POWER, 110V, LOCATED IN REAR OF FRONT CENTER CONSOLE, REAR CROSS-TRAFFIC ALERT, REAR AXLE, 2.85 RATIO, RADIANT SILVER METALLIC, LUXURY PREFERRED EQUIPMENT GROUP includes standard equipment, LPO, HIGHWAY SAFETY KIT includes first aid kit, PVC tape, cotton cloth, fuse kit, bungee cord, cotton gloves, flashlight, rain poncho, screwdriver, booster cables, pliers and Need Help banner, LOCKING FUEL DOOR. 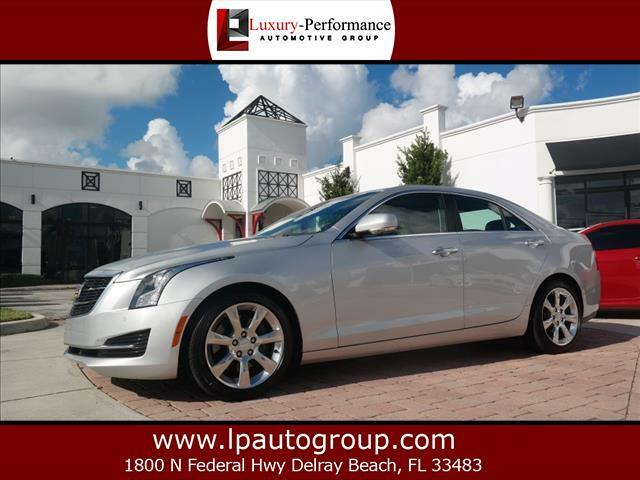 *Drive Your Cadillac ATS Sedan Luxury Collection RWD With Confidence *Delray Mitsubishi & Luxury Performance Automotive Group graded the Overall Condition of this vehicle as Excellent. Clean, non-smoker interior! *Visit Us Today *A short visit to Delray Mitsubishi & Luxury Performance Automotive Group located at 1800 N Federal Hwy, Delray Beach, FL 33483 can get you a reliable ATS Sedan today!